“”We arrived on the 25th, our cabin lights were on, and there were presents for us on the table under a small Christmas tree. Thank you ❗ We have been coming up the week after Christmas for 5 years. It-s a nice get away, nice family time, good food, naps, lots of laughs ❗ The cabin was a bit small for the 5 of us and our lab…but as the old saying goes… -Loves grows stronger in small places…- Wishing light, laughter, and love to all…Tiff, Jay, Taylor, Leah, Cole and Jasper. We get asked daily if the lake is frozen and thankfully….it is continuing to freeze more and more every day. It is worth looking over. Below is just one excerpt from the article. * Never go out on an ice cover alone, and never go out on the ice if there is any question of its safety. * While you are planning the outing, obtain the record of air temperature for the past several days and continue observing air temperatures while the ice will be used to support loads. * Always let someone know of your plans and when you will return. * Listen for loud cracks or booms coming from the ice. In a river this can mean the ice is about to break up or move; on a lake larger than several acres such noises may be harmless responses to thermal expansion and contraction. * Look for an easy point of access to the ice, free of cracks or piled, broken ice. * If you are taking a vehicle or other equipment on the ice, go out on foot first. Vigorously probe ahead of yourself with the ice chisel. If the chisel ever goes through, carefully turn around and retrace your steps back to shore, and try again some other day. * Near shore, listen for hollow sounds while probing. Ice sloping down from the bank may have air space underneath. This is not safe; ice must be floating on the water to support loads. * After getting on the ice, others in the group should follow in the leader-s steps, but stay at least 10 feet apart. * Only after you have learned the characteristics of the ice cover should any vehicle be taken on the ice. It looks like 2007 is going to start out snowy and cold. ..at least that is what is being reported. It snowed most of yesterday and this am…about 2-4 inches here in town but hopefully, more in the mountains and north. A few guest trailered out up into Bald Mountain and said there was a little more snow there and at least they were able to ride today! Although, I think they are just enjoying being here for New Years, good riding or not! Weather reports…it is hard to believe them because it snowed today with accumulation and yet reports say we should not have any accumulation so I guess we all just need to wait and see what mother nature brings us. The lake seems to continue to freeze. Steve went out about 200 yards off our shore and said it was just under 2 inches thick. I do not know if this is “”safe”” to go out on yet, so if you do go out, please use extreme caution. It has snowed lightly for the past couple days and we are finally beginning to look like a winter wonderland. Our positive thinking is working. Keep thinking SNOW! I do not believe this was enough snow to open the trails but it is a great start to a long winter season…in like a lamb and out like a lion…is how I believe the saying goes. This photo was taken this morning. As you may be able to see, our side of the lake has layer of ice and snow but the other side is open. Is Big Wood Lake Frozen Yet? As for the lake…it had a thin coating on it a week ago, then opened up again on the west side. Our side of the lake is still a little frozen. The good news is that the weather reports are calling for temperatures to stay 30 and below so the lake should be ready to fish by season open ❗ We will try to keep our reports updated. 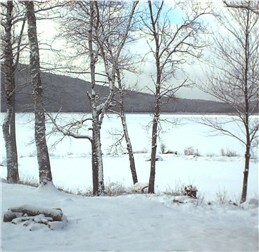 We have not had enough snow yet to brag about BUT today as I drove from the border, it was snowing there and when I arrived home, at Cozy Cove, it started as a small flake and a mix of sleet. Now as I sit here typing this out, the flakes are now large flakes…not a blizzard but it is snowing and I am singing! If we all get into the Christmas spirit and everyday, sing the following carol…..sorry but I only know parts of the song but I think you can recognize it by the following…..Maybe we will have a white Christmas and the snow will continue through to March. If anyone knows the words, feel free to add them to the comments. December 19th – “”David”” was kind enough to send a “”comment”” with all the words to this song.